The Lenni Lenape were the first inhabitants of New Jersey; the Minsi lived in the northern region along the Delaware River. About 1742, pre-Revolutionary families with names such as Leida, Snyder, Cool, Barnes and Brugler, replaced the indians as they settled the northern end of the township. Establishing communities to the south were the Albertson, Adams, Appleman, Robeson and Ramsay families. “Knoll town” so called for the prevalent hills and limestone knobs, was sectioned off from Oxford Township in 1768. The township was part of Sussex County until 1824, bounded on the north by the Blue Mountains and the west by the Delaware River. A new northern boundary was created in 1845 when Blairstown seceded. By 1887, numerous churches in the township had flourishing congregations with the population estimated to be about 2000. By this time the advent of the railroads made easy access to the area for city-dwellers wanting to escape to Knowlton’s scenic landscape and the appeal of the river. With the demise of the railroads in later years gradually the hotels and inns that accommodated these travelers died. Soon to follow were the mills, tanneries, quarries and factories. The township after that was primarily a farming community. Today inter-state highways are the roads now traveled bringing visitors to the same scenic landscapes enjoyed by others so many years ago. 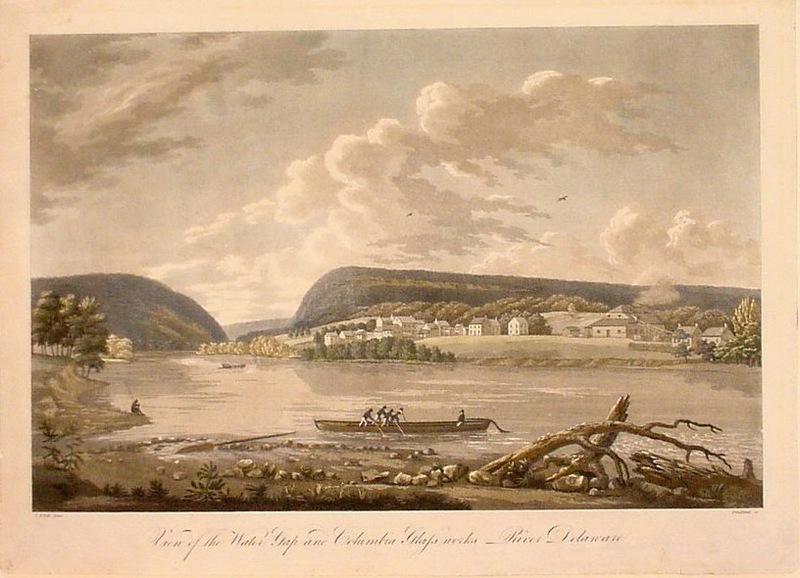 "View of Water Gap and Columbia Glassworks-River Delaware" is the title of thisaquatint by William Strickland, from an oil by Thomas Birch. The Glassworkswas founded in 1812 by Francis Mayerhoff, a Manhattan Merchant. The Knowlton Township Historic Commission (KTHC) was officially established in October 1997. It is our goal to preserve the rural landscape and historic character of Knowlton Township by serving as an educational resource to the community and encouraging a commitment to retain the unique sense of place that is Knowlton Township. Through the efforts of the KTHC, the village of Delaware is listed on both the National and State Registers of Historic Places. Ramsaysburg Tavern and Homestead on Route 46: KTHC has applied for and received four county and state grants so far for the stabilization of and planning the restoration of this historic property. Belles Barn on Walnut Road: KTHC is exploring possibilities for adaptive reuse of this historic barn that include discussions with experts on raising Heirloom Breed livestock in conjunction with Genesis Farm. If history and historic preservation interest you as important components in Knowlton’s future, the Knowlton Township Historic Commission welcomes your involvement. Join as a member or, if your time is limited, volunteer to help with special events and tours. Your friends and neighbors will appreciate your involvement in helping to preserve the character and beauty of Knowlton’s villages, hamlets, farms and scenic landscapes. cultural and scenic resources. By identifying, evaluating and registering significant sites, structures, districts and landscapes, the commission seeks to ensure responsible development in Knowlton Township thereby preserving and protecting our historic and cultural roots. Share your historic photos, letters, books and records to help document the history of people, places, sites and structures in Knowlton and the surrounding area. KTHC meetings are held on the third Thursday of each month at 7:30PM at the Municipal Building. All interested parties are welcomed.